1. The annual parade will go on as scheduled. 2. The annual fireworks show will go on, and may be expanded depending on potential donor interest. 3. The Parks Department is looking into some kind of smaller-scale replacement. A pedestrian struggles through a partially shoveled stretch of sidewalk on Algoma Boulevard. If you are one of those property owners who pay little attention to local rules on snow shoveling, be warned--the city has seen a dramatic increase in complaints through an easy-to-use online app called SeeClickFix. As of Feb. 18 the city had received 84 snow and ice complaints through the app, compared to just seven app-based complaints for all of last winter. “Each storm event is very different, and each round of complaints is very different,” said James Rabe, the Oshkosh director of public works. But he said one clear trend is that more people have turned to online reporting to deal with slippery sidewalks. After the Feb. 12 storm, the city got 14 complaints in five days, Rabe said. One reason may be that the SeeClickFix makes it easy to report a problem--and to do so anonymously. The app also allows citizens to keep tabs on the city’s follow-up. For example on Feb. 10, an anonymous user on the SeeClickFix site complained about two properties on Irving Street “that never shovel.” The next day the Department of Public Works posted an acknowledgement that it had received the complaint and three days later posted that the case had been closed because the sidewalk had been cleared. 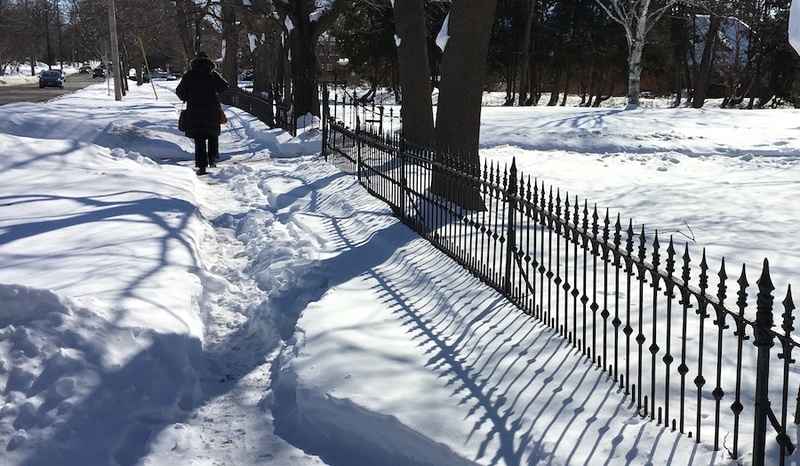 The city requires property owners to shovel their sidewalks within 24 hours of a snowfall. To enforce the rule, a contractor is hired each year to remove snow and ice in response to complaints--with a chargeback to the property owner. The costs can add up, and repeat offenders can get slapped with a $232 citation on top of the shoveling fee. This year the contract went to Jeff Foust Excavating, whose bid calls for a base charge of $72 to clear 100 linear feet of sidewalk. The city puts an administrative fee on top of that, which means that property owners who don’t shovel are looking at a minimum cost of $97 if the city does it for them. SeeClickFix can be accessed either through the city’s website or through a mobile app downloaded to a cellular device. The city has also gotten faster at resolving snow and ice complaints that are received electronically. Last year it took the city 11.6 days to revolve resolve sidewalk issues that came in via app while this year those complaints have been closed in 5.9 days, according to city records. Over the last five years, the city has averaged about 475 shoveling complaints each winter. Last winter the city got 359 complaints but has already exceeded that number for the current season with a tally of 376 through Feb. 18. If you do encounter a property with unshoveled snow after a storm, keep in mind that there is nothing to be done in the first 24 hours after the precipitation has stopped. The city will not accept complaints that are made sooner. The SeeClickFix app is part of a program called Connect Oshkosh. Visit https://www.ci.oshkosh.wi.us/ConnectOshkosh/ to register a concern or to download the app. Students pay up to $3,380 per semester to live in the Horizon Village residence hall at UW Oshkosh. To help fill a budget hole, UW Oshkosh plans to shift $5 million from its residence halls into student academic services. The surplus in the school’s Department of Residence Life “was generated by unanticipated salary savings, delay and/or postponement of building and maintenance projects, and increased revenues from additional room occupancy and conference center activities,” according to a request that was approved by the Board of Regents last week. The money will be spent on student services that have traditionally been funded by tuition and legislative appropriations. These activities include “admissions, career planning and placement, financial aid administration, counseling center and the registrar’s office,” the transfer request document shows. UW Oshkosh students currently pay slightly more for room and board than for tuition, according to the school’s website. During the current academic year Wisconsin residents can expect to pay $4,046 for room and board each semester, compared to just $3,811 for tuition. “We are pleased our plan for responsible fiscal transition continues to have support of the Board of Regents and the UW System,” said Chancellor Andrew Leavitt. “This student supported plan is critical to our strategy to support programs and students on campus." “While the situation is obviously not ideal, we recognize the serious circumstances the university finds itself in and believe that the best course of action is to act in the interests of the university as a whole,” Madeline Hass, president of a campus group called United Students in Residence Halls, said in a written statement to the regents. The UW Oshkosh Foundation expects the costs of its bankruptcy case to total about $500,000 and will emerge from the process with about $22 million in its financial accounts, according to legal documents filed this month. Another $2 million in outstanding pledges is also expected to come through the door once the case concludes, documents show. The foundation hit a slight snag at a Feb. 5 hearing when Chief Bankruptcy Judge G. Michael Halfenger asked for some minor amendments to a plan of reorganization. These changes, which would recognize two additional creditors who are owed less than $10,000 in total, would allow the organization to fast-track the approval process for its settlement plan. The case is still expected to be wrapped up early this year, and the reorganization plan could be approved as early as March 25. The newly filed reorganization plan contains few surprises as the terms of the settlement between the foundation and the UW System Board of Regents have been previously reported. 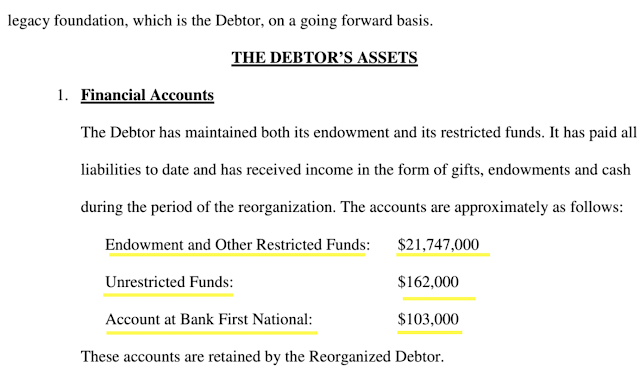 But the court filings fill in some of the blanks of how the bankruptcy occurred and provide a few noteworthy details. The overall Aviation Plaza site has three different owners, one of the complicating factors in redevelopment. Aviation Plaza, the largely empty tract that sits across Highway 44 from Wittman Regional Airport, is attracting renewed attention as a development site, but specific plans have yet to be released. In December City Manager Mark Rohloff told the Common Council that Tom Masters, the owner of the Mineshaft Restaurant in Hartford, was working on a project to renovate the old Walmart site in Aviation Plaza. But that plan would have required tax increment financing (TIF), which drew a negative reaction from several council members. Council Member Steve Herman said TIFs make sense as a tax incentive for developers who need to address infrastructure issues. “The [Menominee Nation] Arena, for example--the TIF there helped with getting rid of contaminated soil. It helped putting in sewer and sanitary,” Herman said. Herman said Masters will have to pitch something bigger than just a restaurant for him to vote for a TIF. Rohloff said the Masters group wanted to submit a TIF application to address problems with the infrastructure including the parking lot, storm water runoff and sidewalks. Walmart left Aviation Plaza in 2003, and JC Penny closed in 2015 while Rogan’s Shoes has remained open. Each of the parcels has a different owner. Pat Rogan owns the Rogan’s Shoes parcel, Phoenix Realty Group owns the JC Penny parcel and Masters owns the Walmart parcel. According to Rob Kleman, the senior vice president of economic development for the Oshkosh Chamber of Commerce, having three property owners makes redevelopment difficult, because regulations have changed since the site was built. Hurdles to redeveloping the area include Infrastructure, stormwater retention and building plans, said Audra Hoy, director of business and economic development for the Greater Oshkosh Economic Development Corp.
Hoy said regulations regarding stormwater retention are another hurdle for developers because all the parcels can’t share stormwater retention facilities. Another restriction to redevelopment of the site are airport overlay regulations, which dictate what can and cannot be built on the site, Kleman said. Kleman said the current airport regulations allow for a restaurant to be built only on the northern end portion of the site. Despite hurdles to development, Herman noted that the council approved a plan to build a Sam’s Club in Aviation Plaza in 2015, but the deal fell through. Hoy said Aviation Plaza is attractive to developers because it’s near Interstate 41 and the Experimental Aviation Association grounds. “There have been people interested in the JC Penny parcel on and off since it became available, same with the Walmart parcel,” Hoy said. “I think it’s just going to be the right fish on the right line at the right time.” Herman said the city has a vested interest in redeveloping Aviation Plaza because it is a gateway to the city. Private donations keep the city's Menominee Park Zoo free of admission charges for visitors. For all those Oshkosh residents who like to complain about local taxes and fees, it may come as a surprise that quite a few people are willingly sending money to City Hall. Over a three-year period from 2015 to 2017, the city received almost $2 million in gifts, according to recent reports presented to the Common Council. Cash gifts were the greatest in 2015, at $701,248, falling to $537,987 in 2016 and then bouncing back up to $599,238 in 2017. The number of cash gifts ranged from a low of about 250 in 2015 to a high of about 360 in 2016. These figures do not include the number of small donations, less than $100, which are typically lumped together, or of in-kind gifts. 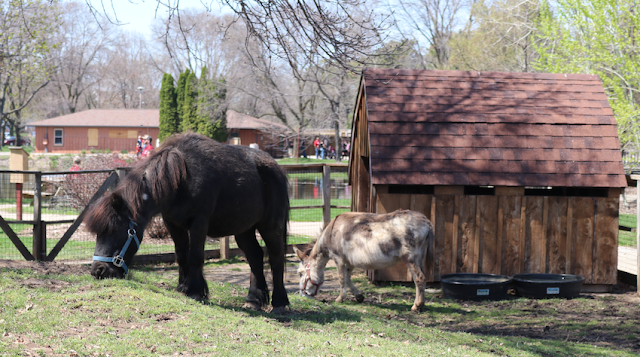 The largest single gift was $65,000 from the Oshkosh Area Community Foundation for the Menominee Park Zoo, a sum that was given on three different occasions. This is the amount that has been pledged on an annual basis by a local couple, Tom and Penny Harenburg, who set up a special fund at the foundation to provide free admission to the zoo. Many of the gifts are intended to support quality of life activities in the city, such as city parks, the Oshkosh Public Museum, the Oshkosh Public Library, the old Lakeshore Municipal Golf Course and the Pollock Community Water Park.